Like people, trees can bleed. Unlike people, this bleeding occurs mostly in the spring, at least in temperate parts of the world. As winter subsides and temperatures rise, deciduous trees begin to move sap (a dilute sugar solution) from their roots up to their branches to fuel the growth of leaves and flowers. Where a tree has been wounded (e.g. by a rutting deer or logging corporation), they will often bleed sap. This stuff makes great food for yeasts. Being ubiquitous in outdoor air, these fungi inevitably end up landing on a sap-soaked tree wound. They grow rapidly, producing a pungent sludge that appears to be oozing from a wound but in fact is just following the trail of its leaking sap. The yeasts inhabiting these tree slimes are eaten by nematodes and fruit flies, which in turn are eaten by larger organisms, and the circle of life moves ever forward. The pretty colours of tree slimes are the result of yeast-made pigments. One of the pigment makers is Xanthophyllomyces dendrorhous (aka Phaffia rhodozyma). In the northern hemisphere, X. dendrorhous is typically found on sap oozing from birch trees (genus Betula) in temperate forests, turning them a vibrant pink to orange colour. However, down in Patagonia, X. dendrorhous hangs out on southern beech trees (genus Nothofagus). More precisely, the yeast inhabits the fruiting bodies (mushrooms) of Cyttaria hariotii, a parasitic fungus capable of taping into a southern beech tree's sap ducts and growing clumps of what appear to be spongy yellow golf balls every spring. These balls are rich in sap-derived sugars, presumably making them very attractive to X. dendrorhous. 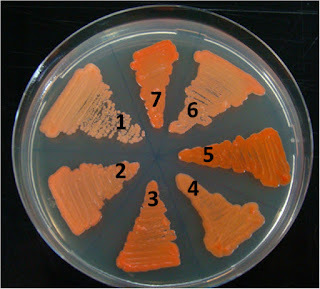 Unlike any other fungus we know of, X. dendrorhous is able to produce a reddish orange pigment called astaxanthin. A derivative of beta-carotene, astaxanthin can function as an antioxidant and is thought to protect yeast cells from oxidative stress caused by their exposure to sunlight. It's also what gives certain shrimp, and consequently flamingos and the scarlet ibis, their pink colour. Astaxanthin is highly valued for its ability to help ensure salmon, lobsters, chicken breasts, and egg yolks have the appealing colours we enjoy and have grown to expect when we purchase them. The pigment is added to animal feeds (e.g. for salmon farming), leading to its uptake and incorporation by those who ingest it. It's fairy expensive, and there is a big market for it, so there has been a lot of research into how to reduce the cost to produce it. In particular, efforts have been made to coax X. dendrorhous, which can be fairly easily grown in giant tanks, into making more astaxanthin. Thanks to this, we now know quite a bit about how the pigment is put together by the yeast and what environmental factors influence its synthesis. Beyond its use as an antioxidant and feed additive, there is some evidence that astaxanthin can reduce inflammation and protect the brain from damage. X. dendrorhous also produces β-fructofuranosidase, an enzyme capable of catalyzing the synthesis of fructooligosaccharides. These short chains of fructose molecules are of interest due to their ability to function as prebiotics, selectively enhancing the growth of health-promoting bacteria in the gastrointestinal tract. The yeast may provide a means of producing these beneficial compounds on a large scale. David-Palma M, Libkind D, Sampaio JP. 2014. Global distribution, diversity hot spots and niche transitions of an astaxanthin-producing eukaryotic microbe. Molecular Ecology 23(4):921-932. Weber RWS. 2006. On the ecology of fungal consortia of spring sap-flows. Mycologist 20(4): 140-143. Weber RWS, Davoli P, Anke H. 2006. A microbial consortium involving the astaxanthin producer Xanthophyllomyces dendrorhous on freshly cut birch stumps in Germany. Mycologist 20(2):57-61.